Happy Tuesday, friends!! How has your day been? Mine kind-of got away from me....and am just getting a chance to get on my laptop & get my post up. I'm having a couple problems with my photography website (ugh- I hate technological issues). While it isn't completely solved yet, the big problem of not being able to take payments, has been fixed. I'm booking a lot of weddings right now, so being able to take their first payments is kind-of important, to say the least. Lol. 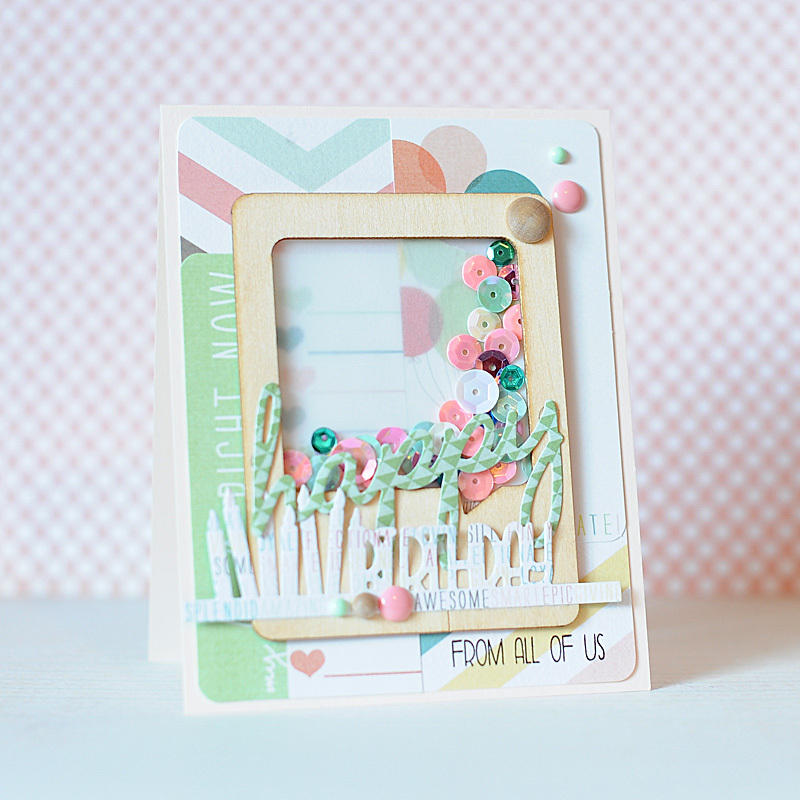 Like I said yesterday, I have a card to share with you using new WPlus9 stamps & dies, and new My Mind's Eye product as well! So, I just want to dote on some of the new WPlus9 cardstock right now. I love all the new product that was released this month, but I am especially loving the cardstock. This new color, which is called Cashmere, is the perfect shade of blush pink. Not to pink, it can almost be mistaken for a cream...it is just the most perfect shade. I LOVE it. 1. Make A2 card from cashmere cardstock. 2. Cut striped background paper slightly smaller, then round the corners using a small corner punch. 3. Cut two journal cards in half, and adhere to the opposite corners of the background paper. 4. Stamp "From All of Us" to the lower right corner in onyx black ink, then adhere the entire paper block to the card front. 5. Layer a piece of vellum to the bottom of a wood veneer card, then adhere to the card front. 6. 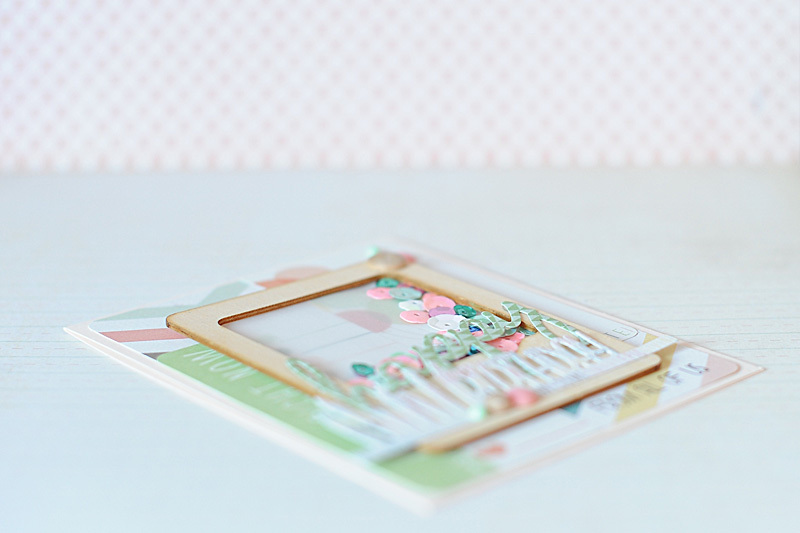 Add permanent glue strips inside the frame, then sprinkle sequins randomly onto them until the corner is fully covered. 7. Diecut the word "happy" and the candle border from patterned paper. 8. Adhere the diecuts to the top of the wood veneer card. 9. Accent with wooden & enamel dots to finish. 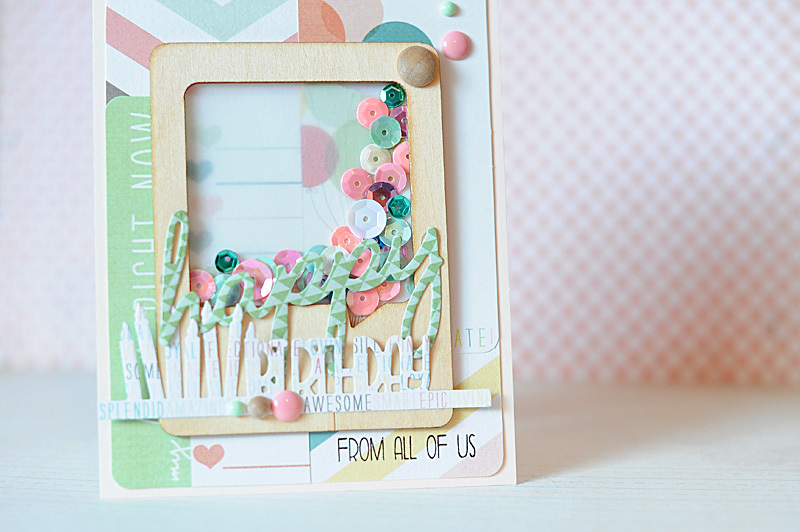 I love how soft & sweet this card is...I just realized that it has been a LOOONG time since I've created a birthday card. This week's WPlus9 Birthday challenge is all about being on trend. I've used sequins & wood veneer as my on trend items, and the Pretty Pink Posh store is giving an exclusive discount on sequin purchases to WPlus9 customers this week! And be sure to participate and link up in this weeks Trend Watch challenge for your chance at winning a $100 shopping spree in the WPlus9 store!! Well, that is all I have for you today! I hope that you have a wonderful rest of your evening. I'm going to watch the Olympics!! This card is beautiful! Love the vellum and sequins. This is so pretty!! I LOVE the MME (think I am join got have to pick that up) and the way you used the new stamps. 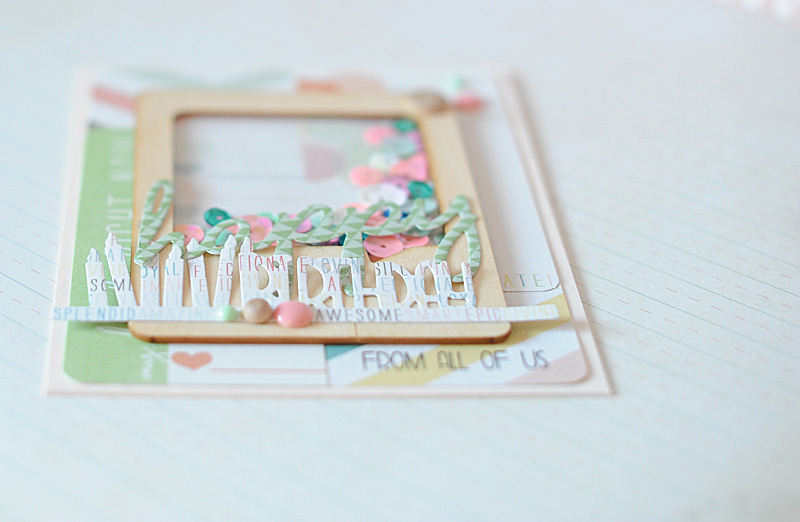 Fabulous card design!! Pure fabulousness! Love all those sequins! You know, my heart must have skipped several beats when I saw you'd entered my challenge!! I still can't quite believe it now! Thank you so so much!! Now, back to the card! Oh my, what a stunner!! Such a gorgeously pretty layering and piling of embellishments and colours, wonderfully eclectic and a sequin shaker too?! Serious LOVE. Thank you *so* much for playing to find a Cure For The Monday Blues!